For guitarists seeking the power of the Ultra-III’s breakthrough electronics in an ES-style guitar, Epiphone is proud to announce the new Ultra-339. Featuring Epiphone’s legendary ES semi-hollow body construction in a reduced-sized, the new Ultra-339 will take your guitar playing to the Ultra-level! First introduced in the late ’50s at our legendary Kalamazoo factory, the ES series became an instant rock classic, bringing the look and feel of an archtop to a generation of players who had grown up playing solid body guitars like the Les Paul. 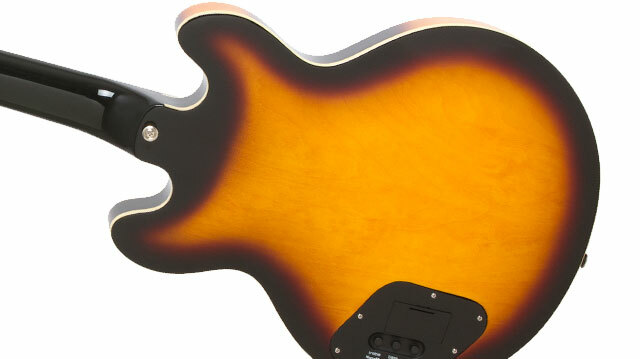 The ES-335, the first in the ES series, was an instant success. But for many players who were used to smaller solid body guitars, the ES-335 felt too bulky to play on stage. The new Epiphone Ultra-339 is the perfect remedy, featuring smaller body dimensions while still retaining the bell-like tone the ES series is famous for. And best of all, the Ultra-339 is loaded with Ultra technology! Like every Epiphone, the Ultra-339 features Epiphone’s Limited Lifetime Warranty backed by the world famous 24/7/365 day Gibson Customer Service. If you want a versatile professional instrument designed for live performance or studio and capable of both semi-hollow growl and real acoustic-like tones, come home to the new classic, the Epiphone Ultra-339! While the Ultra-339 is packed with cutting edge technology, it still maintains the same basic specifications that made ES-style guitars the choice of two generations of artists from Chuck Berry to B.B. King to Alex Lifeson. The Ultra-339 features a laminated maple body with a solid center block, classic f holes, and a comfortable 24.75” scale SlimTaper™ “D” profile mahogany neck, which is glued-in with a mortise and tenon neck joint. The 12” radius rosewood fingerboard has 22 medium jumbo frets just like vintage ES-style archtops, a 1.68” nut and pearloid dot inlays. 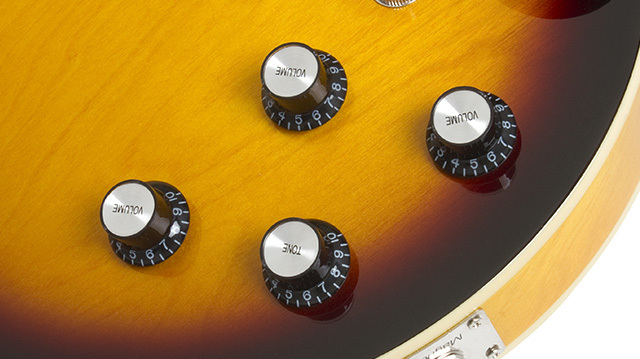 The Ultra-339 comes in three beautiful color finishes: Cherry, Natural and Vintage Sunburst. 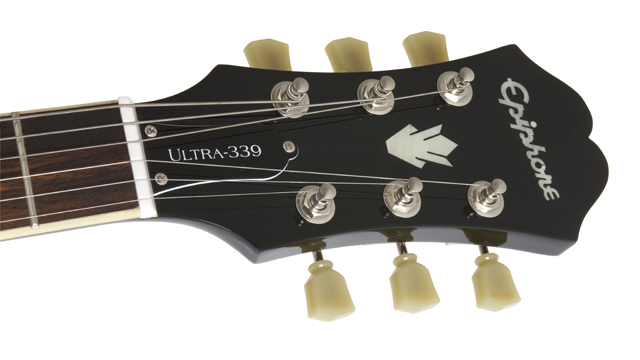 At the heart of the new Ultra-339 are two pickup systems. 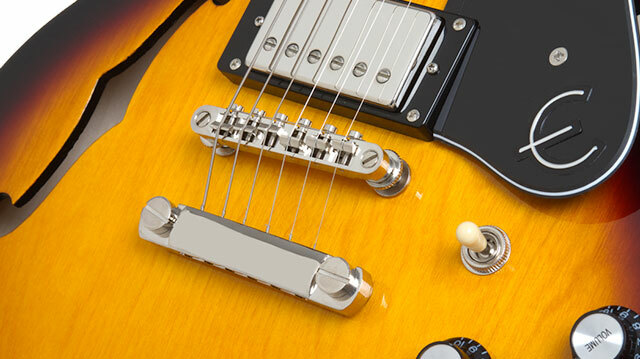 The classic pickup system features Epiphone's new ProBucker™ humbucker pickups—a ProBucker™-2 in the neck position and a ProBucker™-3 in the bridge position. Both are patterned after Gibson's famous BurstBuckers™ and are wound to the same specs as the Kalamazoo factory’s legendary PAF pickups. Epiphone’s ProBuckers™ feature authentic 18% nickel silver base and cover, Elektrisola wire, accurate bobbins, slugs and screws and sand casted Alnico-II magnets to give you that classic "Patent Applied For" airy tone that defines rock and roll. The second pickup system features Shadow™ Germany's patented NanoMag™ pickup embedded discretely at the end of the fingerboard. Featuring three samarium cobalt magnets, an air coil, and active electronics, this low-impedance pickup captures subtle body acoustics and string harmonics. Together, you get powerful humbucker-driven rock crunch as well as shimmering acoustic-like tones and everything in-between. Built discretely into the bridge pickup mounting ring is a full-function, chromatic tuner. Just push the ON/OFF button and sound is immediately muted when the tuner is activated. Eleven color-coded LED's identify the note and whether it’s sharp, flat or in-tune. Also, to allow quick and seamless changes between each pickup system, the Ultra-339’s NanoMag™ Volume control now doubles as an A/B switch. 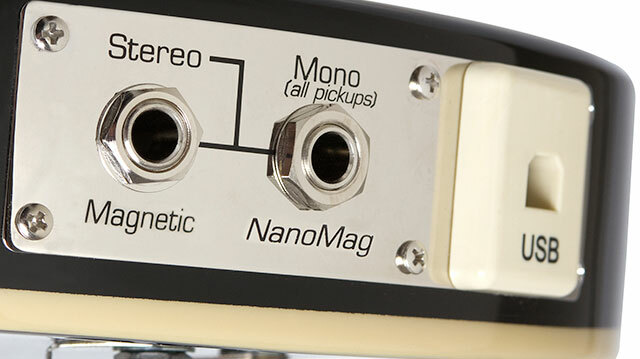 Just push it in and quickly toggle between ProBuckers™, NanoMag™ or both pickup systems with no delay and no "pop." Two additional LED's on the pickup mounting ring provide a visual indicator of which pickup system is active (Red=NanoMag; Blue-Magnetic or Red/Blue=Both). The Ultra-339 features three different outputs. By using the standard 1/4" MONO output, both the ProBuckers™ and NanoMag™ are mixed into one signal. Plug in an additional 1/4" cable into the STEREO output, and the ProBuckers™ are routed through one cable and the NanaMag™ the other. In this way, you can send the ProBuckers™ to your favorite guitar amp and the NanoMag™ to a PA or an acoustic guitar amp. Using the A/B switch, you can now change "on-the-fly" between the two outputs. Like most Epiphone's, it's also equipped with Epi's patent-applied-for LockTone™ locking tune-o-matic bridge and stopbar tailpiece for increased sustain and string changing ease as well as quality Grover™ 14:1 machine heads for tuning accuracy and stability.